Students are provided with a solubility graph and must use the graph to answer 7 comprehension questions. Students are provided with a solubility graph. They must use the graph to answer 7 comprehension questions. This is a quiz on a unit on solubility. 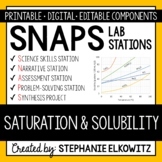 There are 15 questions about solubility, saturated/unsaturated, what will/won't dissolve, and questions pertaining to a solubility graph. Unit 6- Dimensional Analysis, Chromatography Basics, Solubility Graphs, Endothermic vs. Exothermic Includes: 5 Matching (as multiple choice) 45 Multiple Choice Recommended to be paired with the WISE app (www.thewiseapp.com) for easy grading. This was made as a review for a water and solubility test. 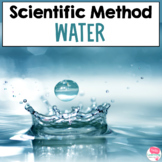 It includes solubility graphs, phase change graph, saturation levels, polarity and the change in water's properties at different temperatures and phases. 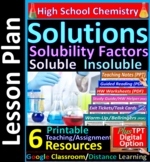 Students will use the following links to watch videos and visit website to answer questions about factors that affect solubility, solubility graphs, and calculate molairty and dilution equations. 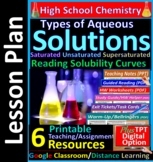 ~Essential Skills Lesson #26~ Organize sets of easy-to-understand guided reading, engaging example problems with step-by-step solutions, and practice multiple choice and short answer questions related to: Types of Solutions; Saturated, Supersaturated, Unsaturated, Dilute and Concentrated Solutions.